I'm delighted to be guest posting on Procrastinails today and thought I would share a few polishes from a new brand I've been trying out recently. Over the last twenty years, I've gone through various periods of not painting my nails at all, but I've been hooked again since 2011 thanks to a particular finish I can't resist: holographic! I've been hoarding holos as if they were going out of style, but of course they're not. Even though I have hundreds at this point I still love keeping my eyes out for new makers. One of the places I like to do that is Etsy, where I frequently type the words Holographic Nail Polish into the search bar. 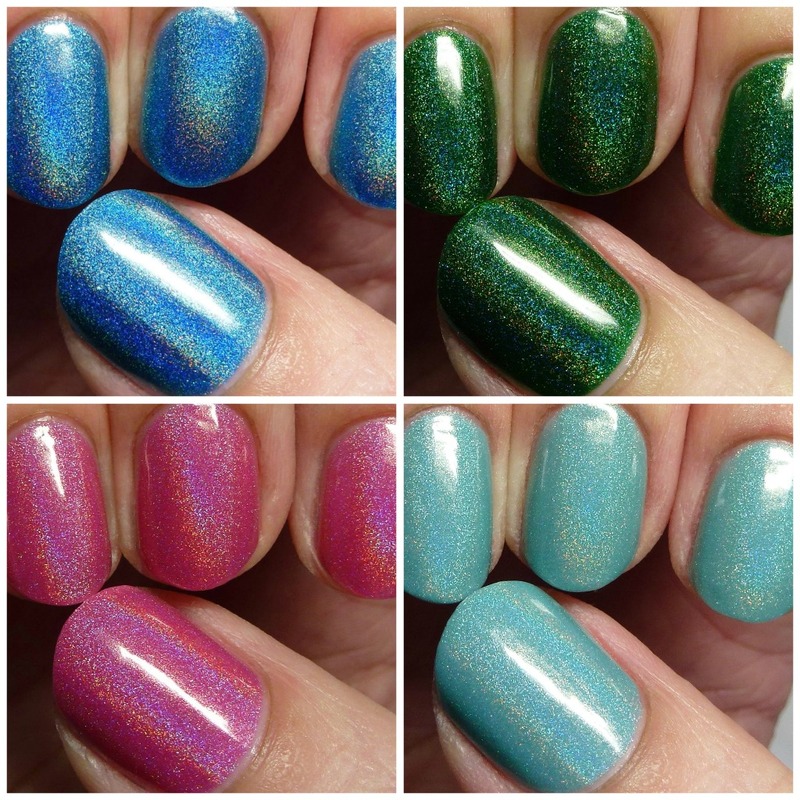 One day some pretty rad holos from Glitzkrieg War Paint showed up and I decided to give them a try. In a big way. As in I bought the whole line, haha! Then Emily, the lovely maker, sent me a few more to try out and photograph as well. At this point I'm pretty good at telling which holos will float my boat or not and I could tell these would have plenty of jazz about them. Many of them have a jelly finish, meaning the base is translucent. While I love super-opaque holos, too, each type has its place. Jellies are not as good for things like stamping or detailed nail art, but they have a unique depth to them when layered by themselves or with other polishes. Since they are translucent, the light can reach down to the bottom layers and pick up the base color as it reflects back, yielding a rich effect. 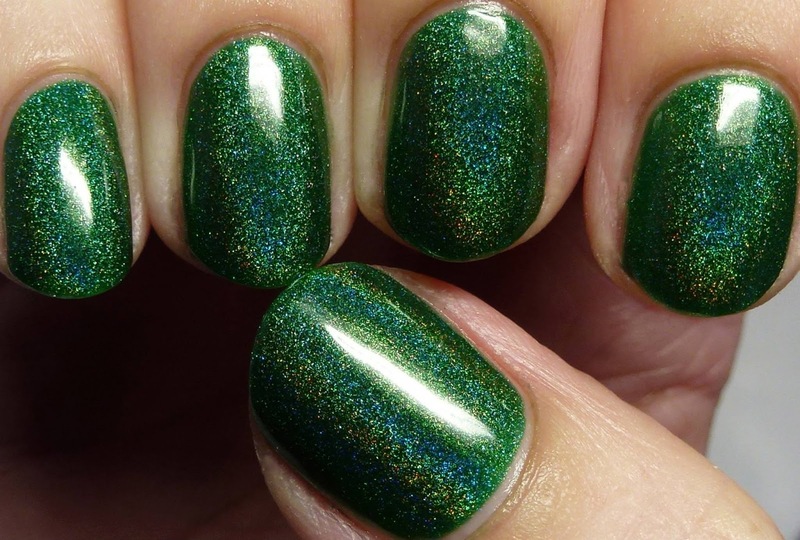 They can also be used as holo top coats and for nail art techniques that require translucency, such as syrup manis. I've picked out four of my favorites so far from the line. 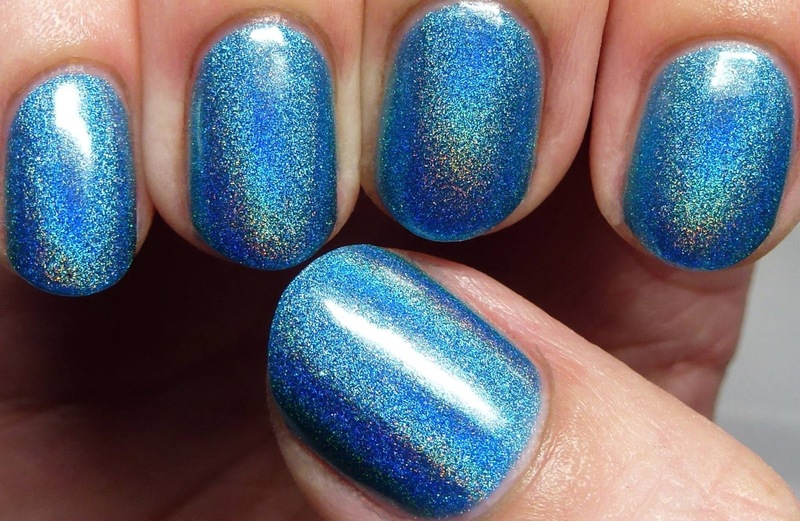 First on the list has to be Deluge, an azure that is so crazy-holo that it looks 3D on the nails. It glows even in low light and makes my nails almost look like they're cartoon shiny. I'm showing it here with four coats for maximum effect. Perfect formula and great wear time, too. 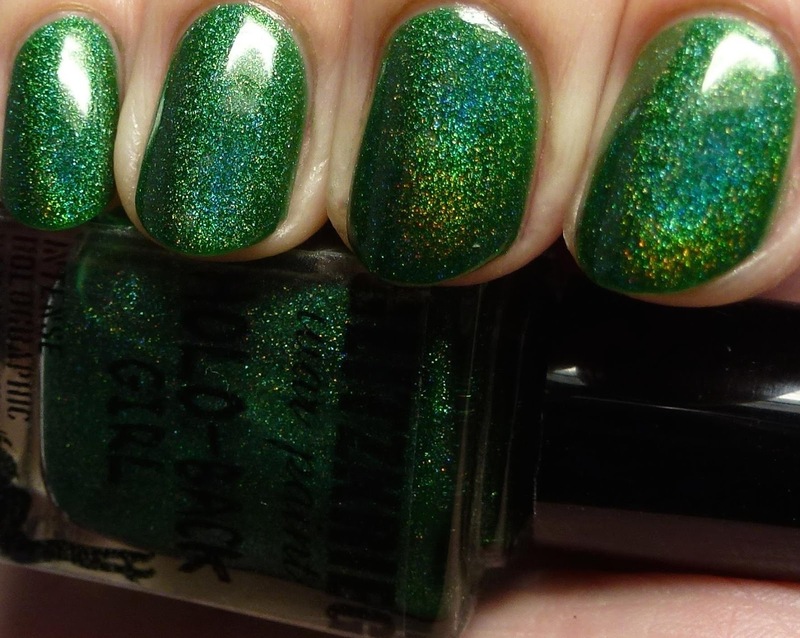 Next is Emerald, a rich, deep green. This one is more opaque than Deluge, and most people could get away with 2-3 coats, but again I used four. I love these kind of vibrant greens. Again, great formula. Then there's Dusty Rose. This is more of a conventional work-safe type of shade. 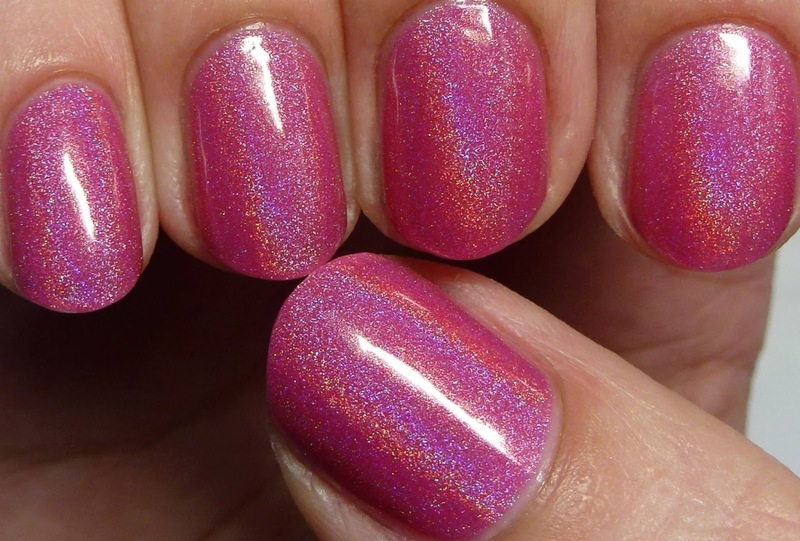 It is also more opaque but it could be used as a kind of soft look at one coat, or layered for a full-on pink. Finally, High Noon Sky rounds out this selection with a soft, creamy sky blue. I can't resist these types of shades. 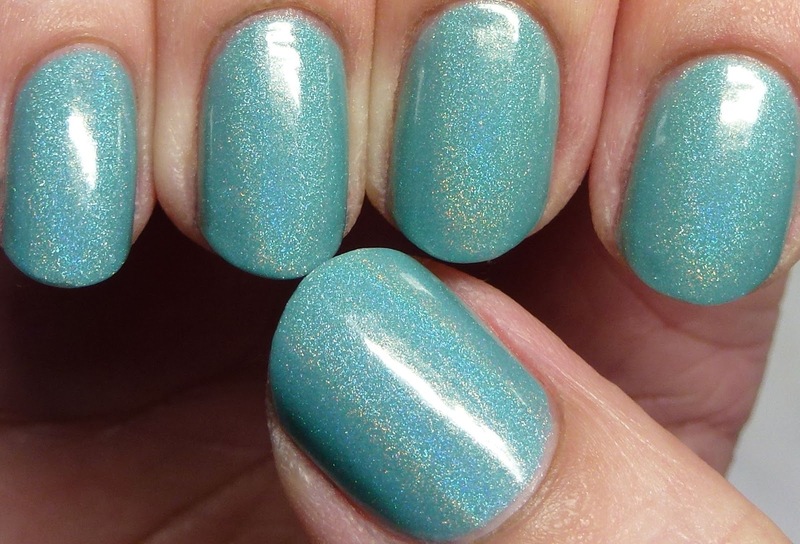 While it looks like a creme base, it has just enough translucency to be super-holo. A perfect Spring/Summer shade, I think. This one required a bit more care in application than the others due to the creamy base, but it was very manageable nonetheless. Hope you enjoyed this selection of new shades from Glitzkrieg War Paint. You can find them here in the etsy shop. Oh and they're $7, a fantastic, affordable price for a full-sized indie holo. Wow great guest post. Those are some amazing swatches you did. I love your nail shape too. Thank you so much for helping me out, lovely!! <3 Wonderful swatches, as always! OMG. This takes me back to those sparkly Happy Meal toys from the '90s. Such nostalgia. BEAUTIFUL POLISHES; I'm in love with them!